On March 14th, 1974 I visited Canterbury Cathedral for the first time and saw Dr E. W. Tristram’s reconstruction of the fifteenth-century wall painting, The Legend of Saint Eustace. This book was begun on May 14th, 1974 and completed on November 5th, 1979. A while back the Guardian had a feature on post-apocalyptic novels, and in the list was Russell Hoban’s Riddley Walker. I have been meaning to read this book for a long time – now I finally got round to it. It was a rewarding experience. recalls the ‘smashed mess of mottage’ of Finnegan’s Wake…Guttural yet eloquent, we hear in it echoes of rudimentary English (and a tendency toward sagas) that evoke Beowulf, mixed with remnants of the technological catchphrases and political jargon of the 20th Century. I found the process of translating the words, and Hoban’s numerous geographical and cultural references intriguing and stimulating – and the broken language contributes hugely to the atmosphere that Hoban creates. This is a book to which you could return again and again, discovering something new each time. 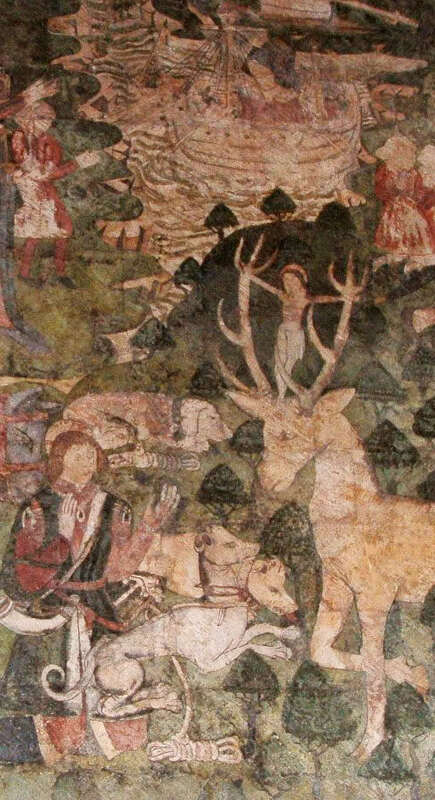 Medieval mural (c.1480) of the Legend of St. Eustace. 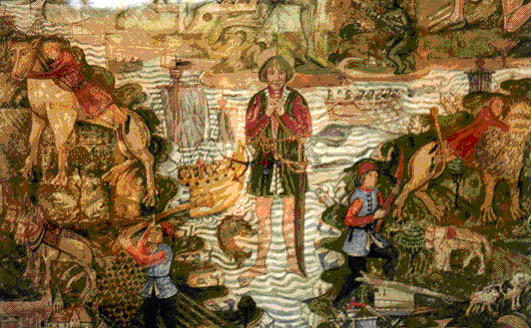 There are trails to pursue as soon as you open the book at Hoban’s acknowledgements, where he notes the encounter with the Legend of Saint Eustace mural in Canterbury Cathedral that inspired and runs like a thread through the novel. 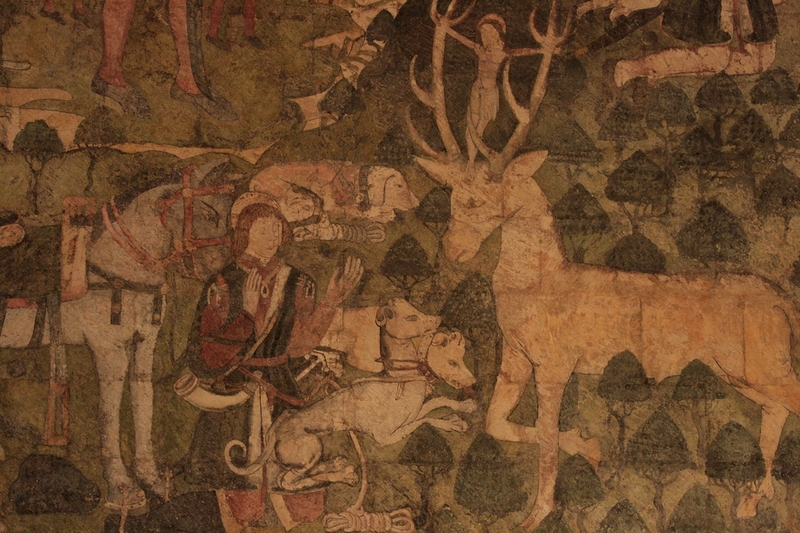 Eustace was a Roman soldier who converted to Christianity after seeing a vision of Christ between the antlers of a stag. He was then tested by the loss of his family in a series of tragic misadventures (including losing his sons to a wolf and a lion while trying to cross a river), but they were restored to him, only for Eustace, his wife and his sons to be roasted to death at the behest of the emperor Hadrian when he refused to make a pagan sacrifice. Hoban uses this legend as the basis of the myth by which Riddley Walker’s people explain the catastrophe that has engulfed humankind. The central myth of these people tells of Eusa who tempts fate by splitting the Addom (atom, Adam) to obtain the secret of the 1 Big 1, leading to an apocalyptic war: a morality tale of forbidden knowledge and the fall of civilization. Riddley Walker is twelve years old, one of only a very few with the ability to read and write . I dont have nothing only words to put down on paper. Its so hard. Some times theres mor in the emty paper nor there is when you get the writing down on it. You try to word the big things and they tern ther backs on you. Yet youwl see stanning stoans and ther backs wil talk to you. He also inherits from his father the ability to ‘tel’ – to draw out meanings from stories and events and make prophecies. At the start of the story that he sets down, three things happen to him that seem to him to be freighted with significance. First, on the day he turns twelve he kills a wild boar, and notices the leader of a wild dog pack watching him closely. On my namin day when I come 12 I gone front spear and kilt a wyld boar he parbly ben the las wyld pig on the Bundel Downs any how there hadnt ben none for a long time befor him nor I aint lookin to see none agen. Three days later Riddley’s father is killed in a work accident. Later that day, Riddley again encounters the leader of the wild dog pack which throws itself on Riddley’s spear. He sees this as an omen of ‘the far come close took by the littl come big’. Humanity, moreover, is poised to advance. Already an agricultural order seems to absorb more and more of the human energies once expended on hunting and gathering. The death of the last wild pig, with which the story opens, represents the passing of wilderness … But civilization flourishes with knowledge that in the end proves destructive. Humanity in Riddley’s time ‘roadits’ toward the more civilized order that its own past record makes ambivalent. This point comes into focus in the particular advance whose pursuit structures most of the novel: the reinvention of gunpowder. This here figger tho it wernt like no other figger I ever seen. It wer crookit. Had a hump on its back and parper sewt there in the clof… The face had a big nose what hookit down and a big chin what hookit up and a smyling mouf. Some kind of little poynty hat on the head it curvitover with a wagger on the end of it. [I]t come to me what it wer wed los. It come to me what it wer as made them peopl time back way back bettern us. It wer knowing how to put their selfs with the Power of the wood be come stoan. The wood in the stoan and the stoan in the wood. The idear in the hart of every thing. What a beautiful post. I wrote about Russell Hoban myself, but not so well. What a brilliant description. Excellent images too; you have gone to a lot of trouble. Thank you so much! Thank you – you have succinctly and articulately touched on the ‘hart’ of this wonderful book. I’ve lost count of how many times I’ve read it, but this has inspired me to return to it yet again. This certainly is how ‘the light gets in’ – inspired choice of title from Leonard! Thank you for this excellent post. I’ve quietly raved about this book for 30 years, so introductions of this quality will hopefully entice more people to discover Riddley’s dark world. I honestly think that Hoban’s feat of imagination, & its cohesion, is staggering. Then again, some people can’t get past the first few pages – too difficult, they say. But what a reward if you persevere!